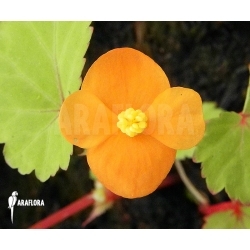 Begonia partita '=B. dregei var. Partita' is a special kind of Begonia with a pretty leaf. This Begonia can survive short spans of time without water due to its thickened trunk or caudex. In the Begonia partita it functions as a storage for water. This exotic plant does well in a terrarium or as a house plant. Begonia sutherlandii originates in Africa 'Tanzania, Zimbabwe and South Africa' where the species grows epiphytically in trees. This plant is a reasonably hardy Begonia which can withstand light frost. It is a tuberous begonia. Place the Begonia sutherlandii in a hanging basket, planter or in solid ground in a shaded but warm spot. When the plant is placed inside - which is advisable during 'Harsh' frost - keep the soil slightly moist and put the plant in partial shade.